On February 1, the Chicago Connectory welcomed City Tech Collaborative and its key partners to the space as they announced the launch of a new cybersecurity training pilot for women in Chicago. The pilot is a collaborative effort ran by ISACA’s SheLeadsTech program and AnitaB.org with the goal of narrowing the gender gap in one of Chicago’s most in-demand technology fields. The event started with Andrea Zopp, CEO of World Business Chicago, discussing the goal of digital inclusion, followed by an introduction to Mayor Rahm Emanuel. Mayor Emanuel then spoke about how excited the City of Chicago is to implement this pilot and how important programs like this are to the Chicago community. Currently, women make up less than a quarter of the cybersecurity workforce in the U.S. Since the cybersecurity field is predicted to grow rapidly, the SheLeadsTech program works towards closing the opportunity gap by offering concrete careers paths for women in the City of Chicago. This program will test the impact of offering free cybersecurity training for women entering the technology field. City Tech collaborated with Anita.B and ISACA to produce a team that could implement this pilot. 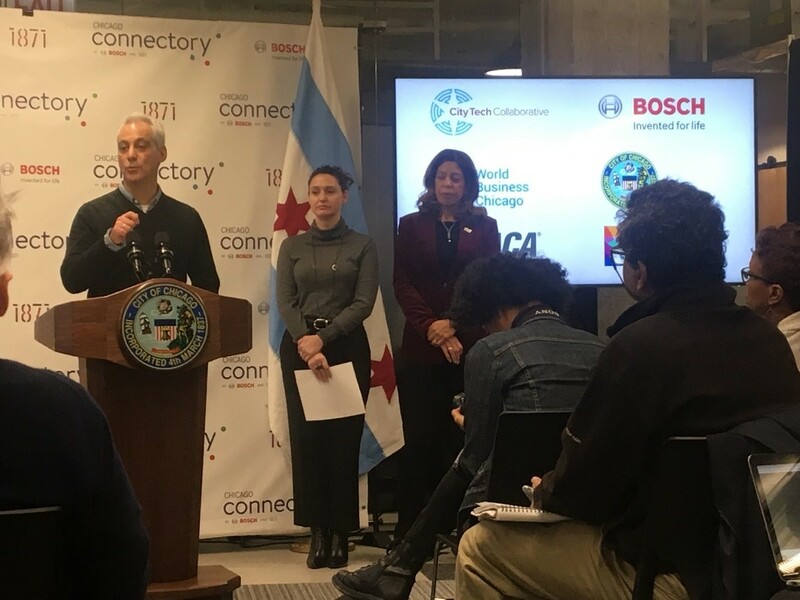 Bosch, City College of Chicago, the City of Chicago, Clarity Partners, Comcast, Columbia College of Chicago, the Grand Victoria Foundation and Microsoft are all contributing resources to make this pilot a success. Reinvents cities by teaming up with partners and people to solve big, urban problems. Currently, City Tech is researching and creating a digital map of Chicago’s underground to solve the problem of subway congestion during large events. Specializes in cyber security, governance, assurance, risk and innovation. They have a presence in more than 188 countries, working their way to transform the world with the power of information and technology. Connect, inspire, and guide women in computing, and organizations that focuses on technology innovation. AnitaB.org, supports women in technical fields and other similar organizations that train and employ women in the next generation.